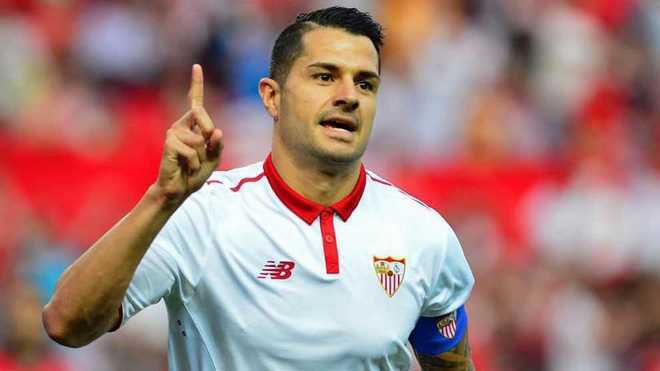 Sevilla have confirmed that they will take Atletico Madrid to court over the signing of Vitolo. The Spaniard was linked with a move to Diego Simeone’s Atleti following the end of the season but due to their transfer ban – a move was seemingly ruled out. However, despite a reported new contract with the Andalusian side, Vitolo eventually made a €37.5m move to Atleti this summer, before being loaned out to Las Palmas until January due to the capital side’s transfer ban and inability to register new players. The move caused much debate in Spain as Sevilla were reportedly close to putting pen-to-paper on an improved deal for the winger and they will now take legal action over his exit. Sevilla further claim that the new contract was agreed by all parties with some media outlets in Spain claiming the Spanish international even signed the relevant paperwork to extend his time at the club, whilst the player himself will now expect to hear from authorities about a ‘breach of contract’, with Sevilla claiming he signed a new five-year contract. Officials from the Ramon Sanchez Pizjuan will now begin court proceedings, instructing their lawyers to gather all evidence. “The board of directors have agreed to take legal action against those who have intervened in the departure of Vitolo from the club,” a statement on the club’s website last month. Vitolo, who spent four years with Sevilla, is currently on loan with boyhood club Las Palmas, who beat Malaga 3-1 on Monday evening.